When I went to the Mansion this morning, I brought some buttons for the aides. They loved the buttons, so much so that I got another idea to polish off Mansion Aide Appreciation Month. So far, we’ve taken photos of most, if not quite all, of the Mansion aides, we’ve given everyone a a $50 Amazon Gift Card, brought sweet Round House Cafe Holiday Cookies to the main office (and some buttons) for the past few weeks. 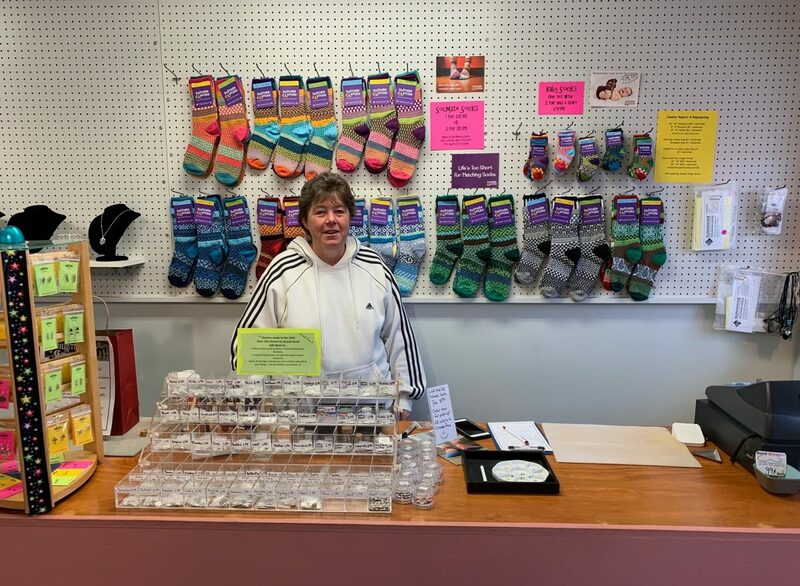 I’d like to add one more thing to these appreciations, I left the Mansion and went right over to see Heather at the Over The Moon socks, beads and “cool stuff” shop right next to Battenkill Books. Heather’s ads are right, the shop is full of cool stuff, and so Heather and I hatched this plan. We picked out three or four things we think the aides might like (I can’t say what they are yet, as some of the aides might see the blog) and Heather will prepare 14 kits, 13 for the aides, one for Kasse, the acting Mansion director. It is privilege to try to give some recognition – and some material gifts as well – to these amazing young women. While I was at Over the Moon, I got a pair of those red socks for Maria. Heather will get back to me next week. I’m excited about this. She doesn’t like to get presents, so I stuffed the socks in the bag of Minnestrone soup I brought home for lunch from the Round House Cafe. She didn’t squawk this time, she loved the red colors above Heather’s right shoulder and head. Maria has trouble with Christmas, she doesn’t like to get presents, so this year I promised not to give her any presidents on Christmas. I can get away with getting a few before hand. I also distributed some cash to the Mansion residents so they could buy presents for one another and some of the aides. So far, most of the residents want me to pick up some gift cards at the bookstore or at a local convenience store. They are thrilled to be able to give as well as receive. Several people have asked for an updated resident list. I got one today, but I warn you that the list changes frequently, almost daily, and I am not allowed to explain the changes – some may involved medical issues, or trips to a nursing home or other facility. Winnie, Ellen, Matt, Mary, Gerry, Sylvie, Diane, Alice, Jean, Madeline, Joan, Allan, Bill, Blanche, Helen, Alanna, Peggie, Dottie, Tim, Jackie, Guerda, Brenda, Wayne, Ruth. If you wish you can also send cards to Julie Harlin, the activity director, and she will distribute them. The address is the Mansion, 11 S. Union Avenue, Cambridge, N.Y., 12816. Thanks for doing this.